Great Southern Brewery: Terrapin Beer Co.
Terrapin Beer Co. is neither the biggest nor the smallest craft brewer in the South. They’re not the slickest nor the one most steeped in Southern culture. They simply churn out an astonishing array of creative and unpredictable brews befitting of their Athens home. Their signature beer, the one they debuted with back in 2002, showed that brewer Spike Buckowski had little interest in following in the footsteps of others, and practically jump-started the use of rye in craft beer (a trend that now, 9 years later, is really taking off). And it worked, really well – the Terrapin Rye Pale Ale won a 2002 Great American Beer Festival Gold Medal shortly after it debuted and remains a beer geek standby to this day. Simply put, Terrapin is a great Southern brewery, rooted in its hometown of Athens and spreading the joy of craft beer across the Southeast (and a bit further afield as well). We recently visited Terrapin to tour the brewery. Appropriately enough, some old R.E.M. was playing in the background, though there’s an evident love for the Grateful Dead, KISS and Iron Maiden (F YEAH!) as you look around the brewery. In things music and beer, Terrapin manages to salute its hometown and the South while also embracing good things from all over. That label with a turtle playing banjo in a field of rye says it all. The brewery itself is in a state of expansion, somehow remaining calm while almost bursting at the seams, trying to meet the demand they’ve been able to generate through a combination of solid year round brews and an ever rotating series of seasonals and specials. In terms of the number of beers offered, Terrapin leans pretty heavy to those seasonal and special releases – they’ve been garnering great press and beer geek cred. And Buckowski likes the balance those special releases provide, “I would have to say that we have a great mix of products. Our special beers get a lot of attention because they are either seasonal or one time offerings. People always want new stuff, or stuff that is hard to get, and the release of new beers helps our year rounds as well.” He’s got a great point – almost anyone who tries their Moo-Hoo Chocolate Milk Stout would be thirsty to find out more about Terrapin and their other beers. The label and premise intrigue you, then the beer simply knocks you out and wins you over. A “Black Saison”? A Russian Imperial Stout? Coffee Oatmeal Imperial Stout?? The variety and creativity in the lineup of “Side Projects” and “Monster Beer Tours” is never-ending. While we were in Athens for our visit, we had to ask about the growler renaissance (now available in Georgia at Athens’ The Beer Growler). Buckowski loves the possibilities, but also cautions on making sure beer buyers understand the pros and cons, “Anything that pushes the craft brewing movement along, especially in the state of Georgia, is a good thing. On the consumer end, it can be a double edged sword. Growlers are not like cans or bottles. Once you open one, you should consume it in a day or two. I would hate for someone to serve my beer to a friend of theirs that has been sitting open on a shelf for a week.” While it’s hard to imagine letting a growler of Terrapin sit around much longer than or day or two, it’s clear that this brewery wants their beer to be consumed under optimal conditions. Fortunately, finding great Southern beer gets easier and easier each year, as breweries like Terrapin continue to grow, new craft brewers are born, and retailers do their part with growlers and astonishing variety. 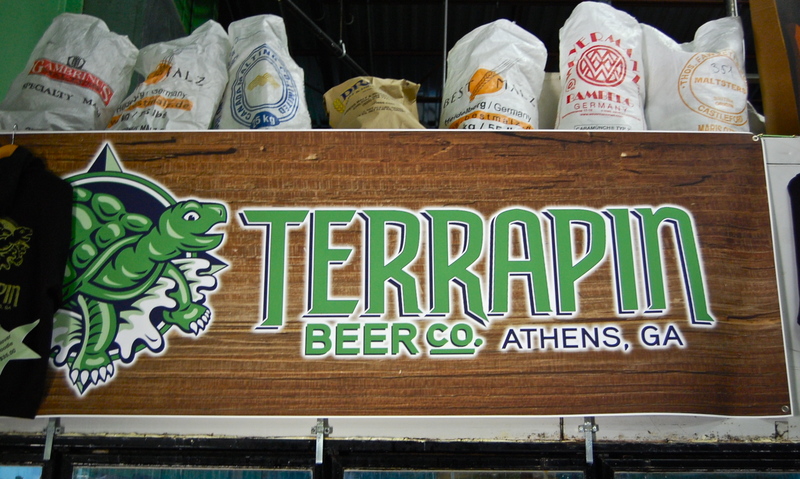 As Buckowski told us, “Craft brewing needs to be a movement, not a competition.” So, if you’re looking to support the great Southern beer movement, pick up a Terrapin beer, or head on over to Athens, where Terrapin offers tours each Wednesday thru Saturday at 5:30PM. I really do enjoy the Terrapin Brewery at the tours. The beers they pour are amongst the best I have had locally. I also love the local scene here in Athens with all the great bars that pour all the great beers. Trappeze Pub in downtown is one of my my favorites to visit along with Aromas in Five Points for some of the freshest and newest releases of terrapin beers. Terrapin does some seasonal releases as well and they are often available more on tap than in bottle. With Growlers being a possibility the 5 Points Bottle Shop on the west side offers many great seasonal beers by terrapin. With 45 taps on draught to go in 64oz Growlers (jugs) 5 Points Growlers always has great beers on tap. For the Terrapin beers they had Moo Hoo, Big Hoppy Monster, and Wake and Bake on tap last Week when I went by to get my Growler refilled. Athens is a changing scene and any beer lover should see what is happening in Athens. We have the best Beer culture the south has to offer. Sandra, absolutely love Athens’ love of beer. The growler wars are on!